Why a new graphic board? 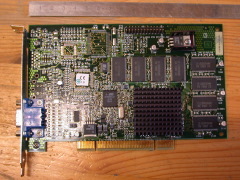 2) (At the moment I wrote this note) the high price of the sole PCI macintosh board on the market: 120 euros for an ATI 7000 32 Mb, which, indeed, is not of high performances at all! So, nothing complicated except the usual precautions when inserting it in the PCI slot. The impressive cooling unit murmurs us to avoid to place it too close of another extension board ! So, now, the flashing program and the mac ROM. -> So asks... Google "Voodoo3 Mac drivers and flasher beta13"
Voodoo 3 Driver - Beta 13 Drivers for Voodoo3 2000/3000. Also includes ROM flasher and ROMs to convert any Voodoo3 2000/3000 to macintosh! Ok: all I need to perform the operation. -> I shutdown the G3, unplug it and put the PCI board into place. Plug-in it again, restarts... but still on the origin board. 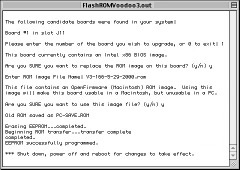 -> So I run the "FlashROMVoodoo3"
The program discovers (as the Apple System Information does) my board in slot J11. It asks me the board ID I want to upgrade and, as it gently suggests me, I key in "1" and hit return. The program then next warns me that the board contains a PC ROM and asks me to confirm the overwriting action. "Hey... it is a Macinstosh ROM.. flashing it now will prevent you to use this board again on a wonderfull Windoze machine..."
The program first saves the initial ROM on the disk... if one day I want to buy a PC ;-)... and finally install the new one. As detailled in the readme file, I put the right files at their right place. 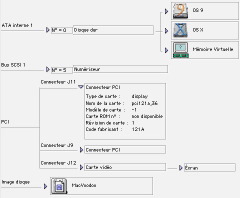 For the "Voodoo3ModePrefs" file, I put it in "Preferences" and in "Préférences" because I do not know if the driver will recognize a French OS. Peformances are confirmed by the speedometer test. Unfortunately, WCIII does not want to start ! My personal opinion is that I do not use it because too slow under X. -> so: this board is interresting under 9 for non recent games.